Usman Khalid is the Marketing and Communications Intern at Music In Detention, a project which brings people living in immigration detention centres together with people living in the surrounding community to create powerful music. 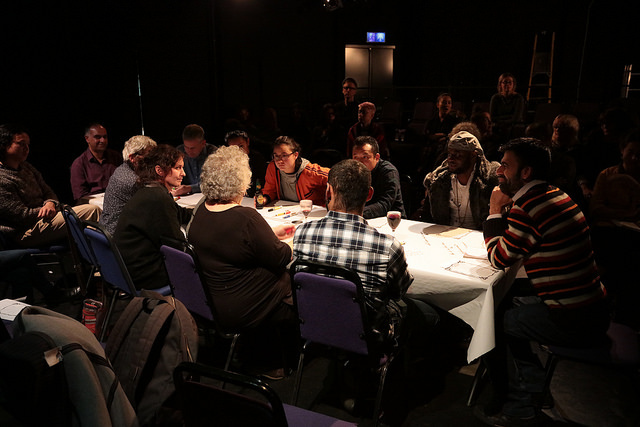 The Long Table was a Music In Detention event at the Camden People’s Theatre. 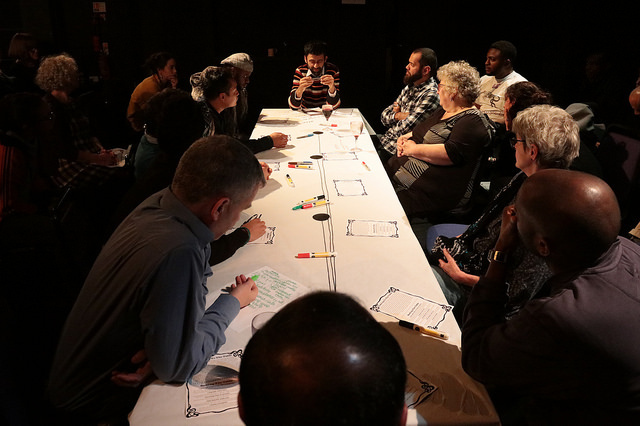 The purpose was to bring together people who have been in detention (roughly 1/4 of the people who attended) with staff, musicians, and the general public to discuss arts and migration. As a refugee and victim of detention myself, and while working with Music in Detention, I can really understand the need of bringing the issues to the Long Table. A discussion is a great way to not only exchange ideas but also to dig deeper into the issues and even find solutions. 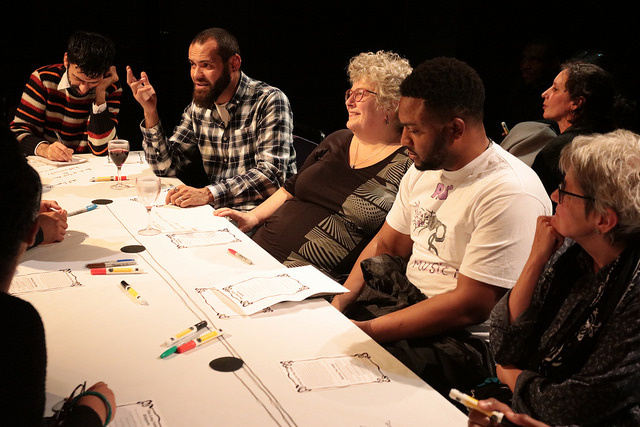 So was the motive behind the discussion held on 1 November 2018 at the Camden People’s Theatre, part of their No Direction Home season. The agenda was to discuss the role of the arts in developing strategies around radical hospitality and creating platforms for important voices and ‘experts by experience’. The chat also covered the role of Music In Detention and others like us in giving a voice to people outside of detention centre walls. Lois Weaver, our event host, began by talking about the need for a Long Table discussion. She came up with the idea after getting frustrated with panels where only a few people get a chance to speak up. Music In Detention Chair Sue Lukes joined along with some others and there you go, the discussion had set off. The participants rotated throughout the evening and the discussion revolved around the areas of: forced migration and the UK’s response to it, the effects of detention centres, the current policy environment, and suggestions on how to make Music In Detention’s work more fruitful. One participant told us about her involvement with people detained in Yarl’s Wood by producing a documentary circling the issues and lives of them. People with lived experience talked about the realities of being inside detention centres. Some people who had spent time in detention thought that UK detention centres are failing. They are expensive to the taxpayer, and the purpose of detention isn’t always clear. The UK is the only country in Europe with indefinite detention, and the majority of those detained are released back in to society. So, what purpose does their detention serve except giving physical and mental torture to those unfortunate people who come under the axe of the Home Office? We also talked about the role of different charities working for people currently or previously in detention. Music In Detention’s role was specifically discussed, in how music has a strong impact on the people inside the walls of detention, and sends messages from detainees out to the general public. Our Director, John, talked about the role Music In Detention plays alongside other charities. Some organisations are fighting on the policy front, but music is just as important: to spread the message from those in detention to the rest of the world, as well as a therapy to the detainees themselves. Music gives people in detention hope to keep on going, to bring out the hidden artists inside of them, and to create contacts outside of detention even after they are released from the centre: to spread the message from those in detention to the rest of the world, as well as a therapy to the detainees themselves. Music gives people in detention hope to keep on going and fighting, to bring out the hidden artists inside of them, and to create contacts outside of detention even after released from the centre. Time was running out and discussion was shaping up nicely. There could have been much more discussed but time was up and our host Lois rang the bell to end the discussion, followed by socialising and music from detention played by DJ Mighty Laous. It was a very useful evening with loads to take home, by so many different people and their experiences and ideas. One of many things I have personally learnt from over the past years while working with so many good people is that you don’t need to wait. Just pick up an issue and start working on it, whatever and whichever way is possible in your capacity. If we all do that, one day the face of the world can be changed for good.